Siem Reap, Cambodia is not just about Angkor Wat, Tonle Sap Lake and all the historical structures although they are the main tourist attractions and paradises for avid photographers. During my recent trip there, I have discovered quite a number of places that are worth checking out especially for first time travellers. Siem Reap is a culture-rich place, where you can truly let your hair down, dress like a local and enjoy the slow-paced lifestyle in this less developed town. No fancy shopping malls, no posh restaurants, no rooftop bars; All you see here is a lot of cheap beers, and a very friendly community although they can't communicate well in English. That's why I love Siem Reap, a perfect escapade from the hectic lifestyle in KL. Passing by all the villages, dusty streets and bumpy roads made me realise how blessed I am, to be able to live comfortably in my own city, as compared to them who are less fortunate here. Speaking from my personal experience, so far I didn't encounter anything bad in the city. But honestly this place is very much lacking of hygiene. I tried to avoid street food as much as possible, drink only the bottled mineral water, wear face mask each time we are on tuk tuk, etc. But I ended having diarrhoea and nausea for the entire week after I came back to Malaysia. The town can be quite happening after the sun sets (After 5pm++). With over 250 stalls around, I was fascinated by the local products here, mostly handmade, such as silk paintings, traditional handicraft items, wood and stone carvings, and clothing. But then I noticed every other stall was actually selling the same things, and some could be dirt cheap, depending on your bargaining skills. 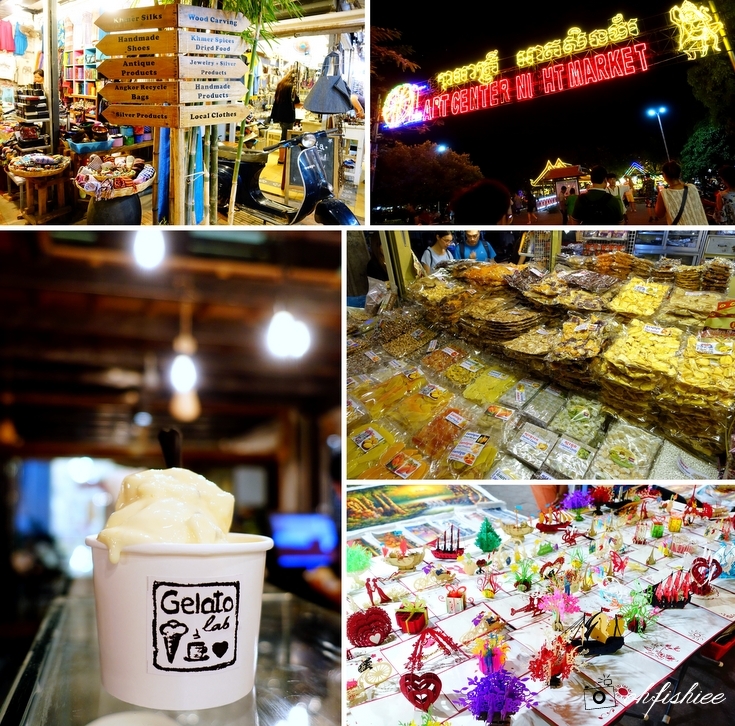 As the night markets here are all clustered within the same area, just take a brisk walk, and you'll arrive at the quieter art center night market. Although it is less happening, there are nevertheless many stalls inside, for you to explore and shop for similar local products. Along the way to this night market, I passed by plenty of stalls selling local snacks including the famous dried mango, banana, coconut candy, tea and local spices. It was quite stuffy and warm in there, hence I dropped by at Gelato Lab located between the alleys for some traditional homemade Italian gelato. Real good to go with a cup of customised blend of coffee. 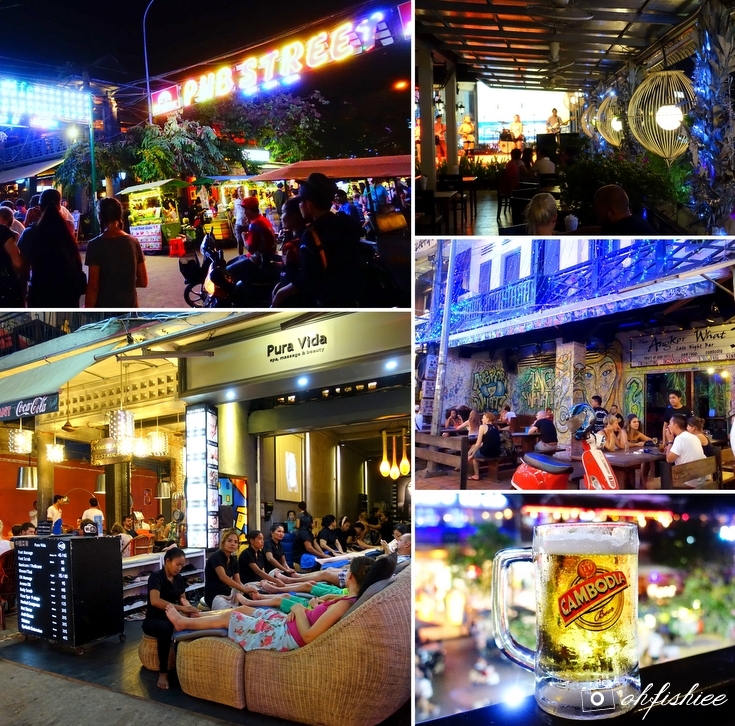 As the night continues, Pub Street is the liveliest area in Siem Reap. 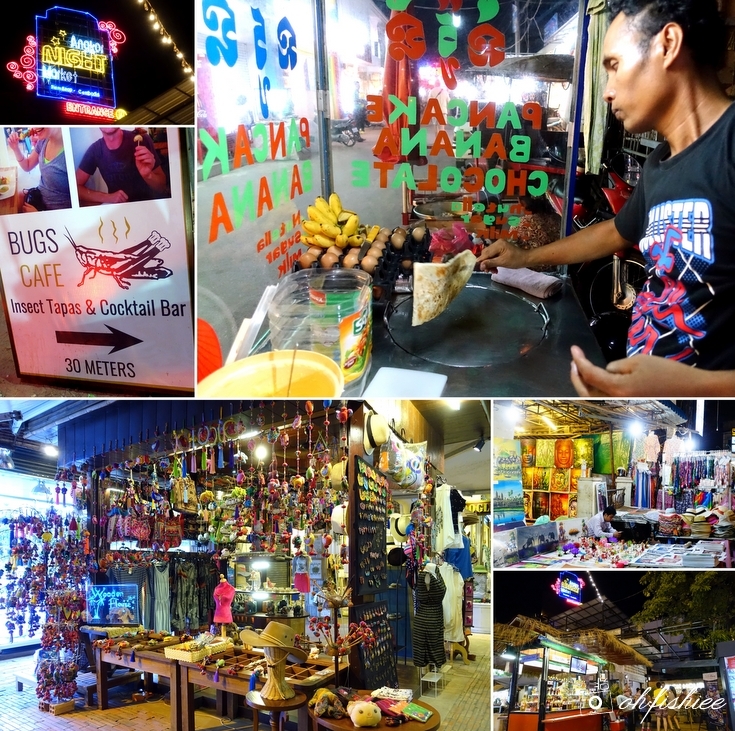 Known for its loud music and insanely cheap beers (Draft beer at USD $0.50! 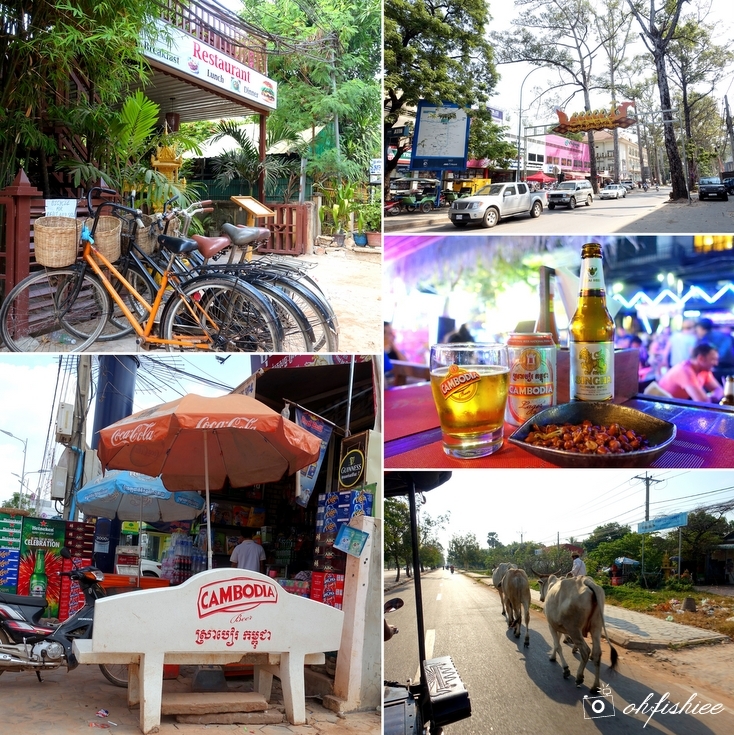 ), the long stretch of road is teemed with countless bars, restaurants and massage shops. Great place to chill and enjoy great live music performances! 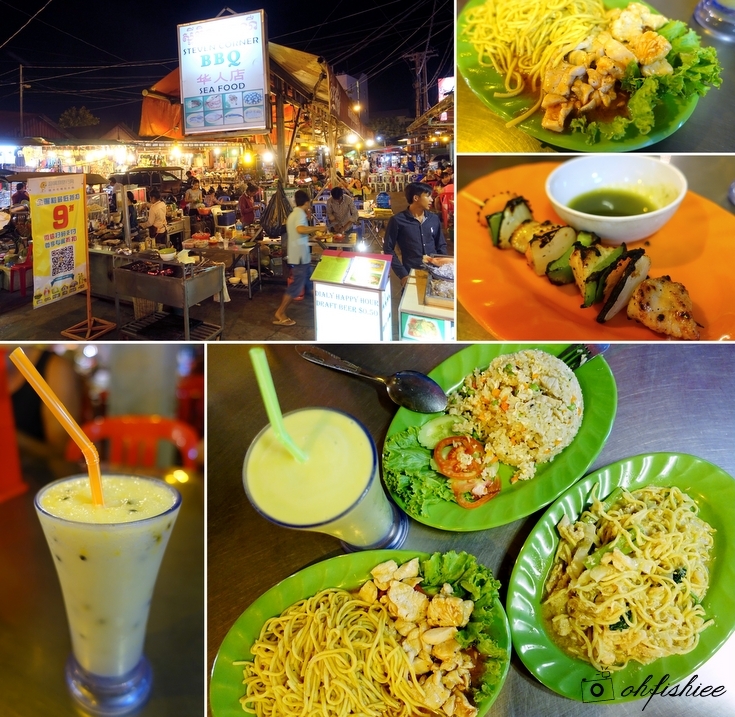 It is the only street food stall operated by Chinese in Siem Reap night market. 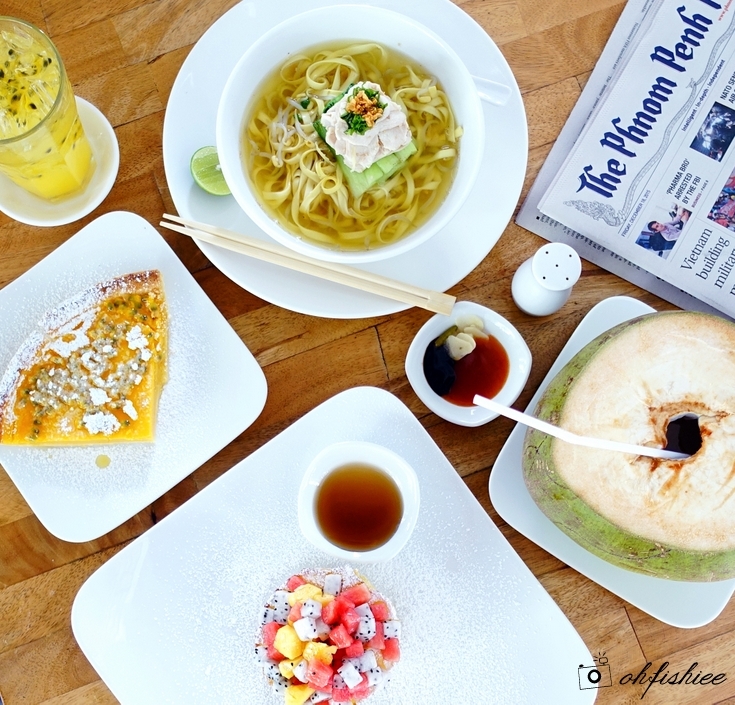 Most dishes such as Fried Yellow Noodles and Fried Rice are only USD $2 per plate, while all Fruit Shakes are affordably priced at USD $1. Must try the traditional Khmer Lok Lak (Stir fried meat) and Amok there ya! BBQ items are slightly more expensive, but worth trying as it goes along well with beers. 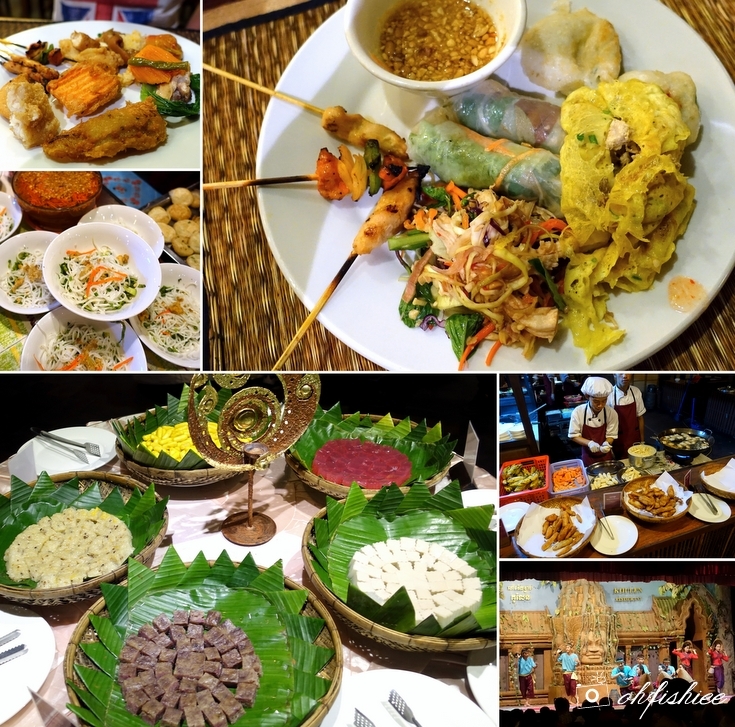 How about enjoying traditional Khmer dance show while having a buffet dinner? I spent an evening at Koulen, one of the most famous restaurants in town serving traditional Khmer, Chinese and Western food for buffet dinner everyday. The restaurant was almost fully occupied (approximately 500 pax) during my visit! Buffet starts at 6pm, whereas the show starts at 7:30pm. By the time the show began, I was already on my dessert. The stage show began with some traditional drum performances, followed by live drama/play-- Quite an interesting epic story of the Hindu history. I am not sure but Lucky Mall seems to be the only shopping mall I see in Siem Reap. One thing I like about this mall is that, the supermarket is chock full of imported goodies, including many Western and Asian brands at surprisingly low prices. 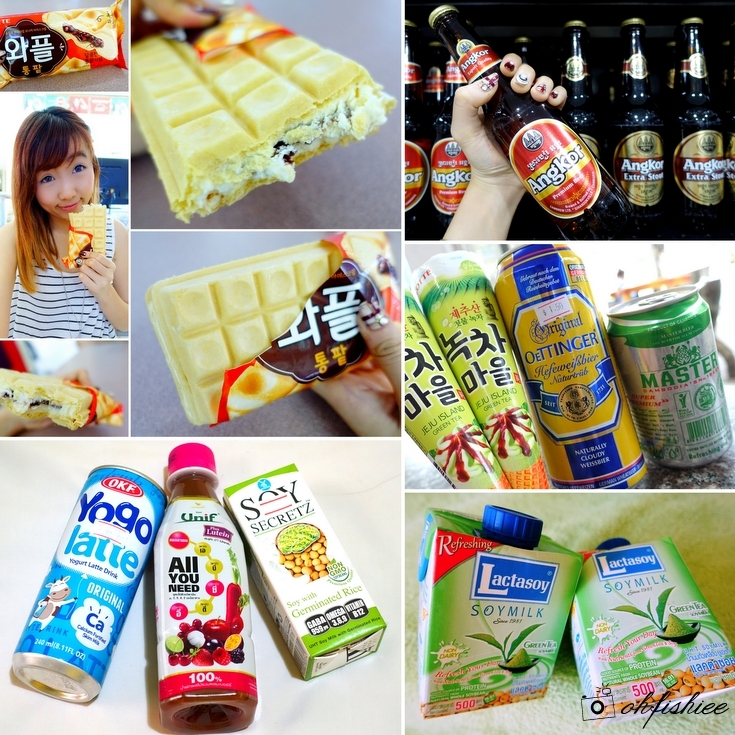 I found plenty of Korean ice creams, German beers, fresh Australian meats, and interestingly-flavored Asian yogurts. The variety there is even wider than those I can find in the common supermarkets such as AEON in Malaysia. A very traditional local restaurant where you can find authentic Khmer dishes at affordable prices. 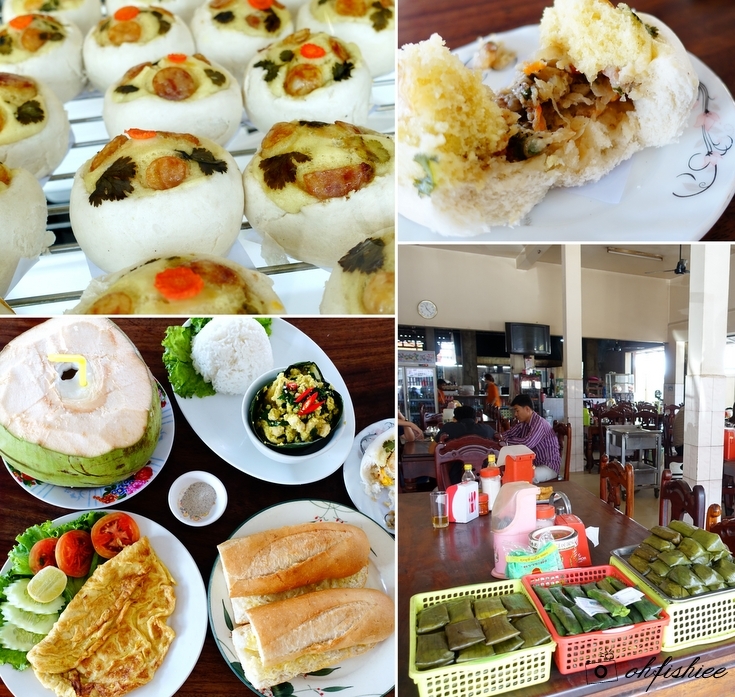 I'd recommend the Cambodian version of Chinese steamed buns (stuffed with pork, egg and sweet Chinese sausage). Interestingly, the bun is topped with steamed cake similar to our Chinese Huat Kueh. Don't forget to try its traditional French Baguette (USD $2), Chicken Amok (USD $3.50) and Pineapple Fried Rice (USD $2.50) too! Totally good value for money. Unfortunately, there is no McDonald's or Starbucks there at the moment. 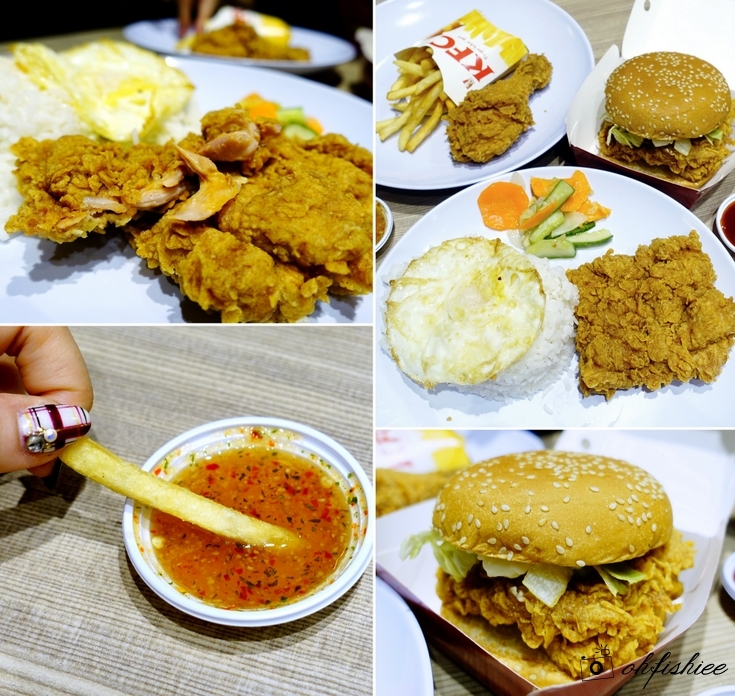 As I started to get bored of the local stuff, KFC was a good change to satisfy my craving for something Western. The menu here is quite similar, except for the Chicken Fillet Rice with egg and pickled vegetables (USD $2.90). What I love the most there was the tangy lime chilli sauce that paired surprisingly with the fries. Each time I go travelling, I'll surely visit Hard Rock Cafe at different places. The one in Siem Reap is unique as it is situated in an old colonial-style building in the historic city center, exuding a sense of class and glam. Love the signature burger and American classics there! I never stop cafe hopping even during travelling :P This cafe, located along the quieter street near Siem Reap river, is a perfect hideout to spend a tranquil afternoon enjoying some Western delights while reading your favourite book. I have not seen such a quiet and calming cafe for a while, and totally love this place! Their Homemade Passion Fruit Tart (USD $2) is a must-try! This river was where I'd pass by each time when heading to the night markets from the hotel I stayed. 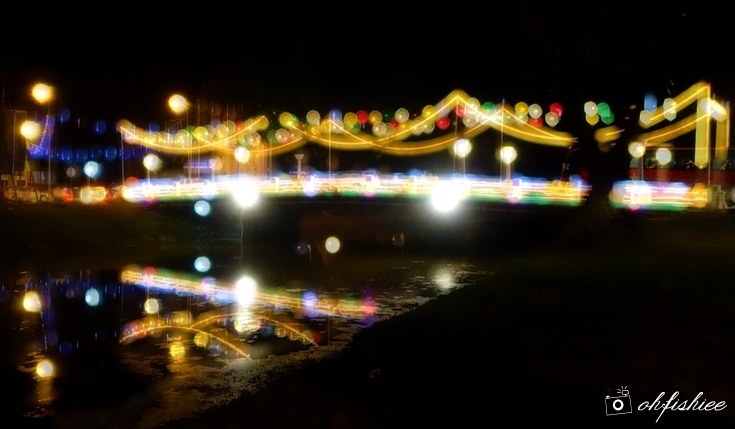 In fact, the first picture of this post was taken by the river too. A very picturesque landmark for pictures, or you can even jog along the pathway of this long stretch of river. Stay tuned for my next post on Angkor Wat and Tonle Sap village visit! Angkor Night Market seems interesting to me. Can get lots of stuff here. Thanks for the recommendation for the places to visit. I actually plan to have that buffet when i pay my visit to Cambodia. It looks nice! Yes. This is in my next to visit location. Thanks for the heads up on the places to visit. I hope halal food is not hard to find. I like the Steven Corner BBQ Seafood at the street, so local. Omai. Im super hungry now and looking at the food pics here is not helping at all! T3T Looks like the night view with all the lights is nice!! U make me want to visit cambodiaaaaaaaa. got hard rock some more. ohman. your pictures really captures the essense of the place.. lovely. Nice writeup Fish, always liked reading your posts.